Use these fun ideas to create your own Sock Monkey birthday party! Sock monkeys are loved by kids of all ages and they can be used as a theme for a great birthday party. 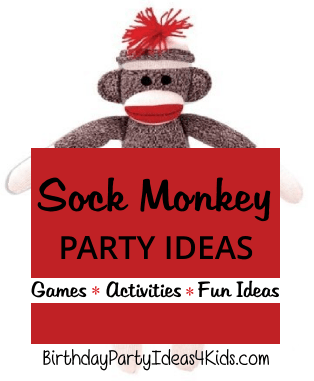 We've gathered our readers favorite ideas for a sock monkey party including themed ideas for invitations, decorations, party games, favors, goody bags and food. You can buy sock monkeys for the party or make them yourself ... here is a great step by step video for how to make one. How to make a sock monkey video. Buy blank note cards with red stripes or polka dots on the front and write party information on the inside. Cut out a sock monkey face from pieces of red, black and white scrapbook paper and glue to the front of note cards. 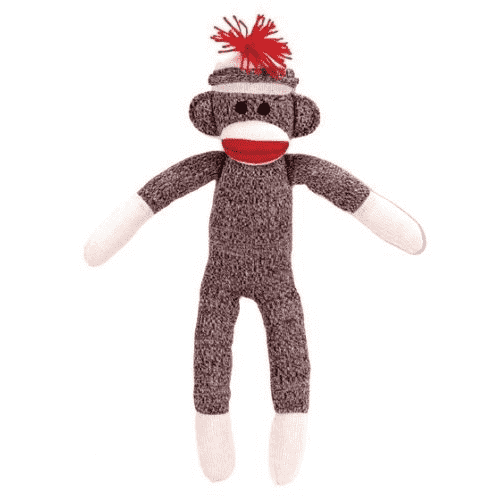 Place sock monkey stickers on plain note cards and write party information on the inside. Decorate the party in black (or brown), red and whites. Red helium balloons or solid red Chinese lanterns are a great accent around the party area. Decorate the party table with black, brown or whites and use red flatware, napkins and cups for an accent. Red and white polka dots or stripes can also blend well with the sock monkey party theme. Hang sock monkeys in the trees outside the party venue and around the party area. Make party hats from red and white polka dot scrapbook paper and attach a red yarn pom-pom to the top of the hat. Fill red, white and black or brown containers with party foods and snacks. A candy buffet is a great idea - fill clear containers with tootsie rolls, cherry sours, malted milk balls, red twizzlers / red vines, pretzels and/ or red and brown M&M's. Let all the little monkeys bounce off their energy in a jungle themed bounce house. Give each guest a sock and have them tuck one end of the sock into the waistband of their pants or shorts so that the long part of it hangs out like a tail. Have everyone stand facing each other in a circle and on the word "go" they try and pull the other kids tails. The child with the most tails at the end of the round wins. Give each child a new pair of men's' white socks. They put the socks on their bare feet and leave about 5" of extra room at their toes. On the word "go" the kids step on each others socks and try to make the sock come off. No hands can be used. The winner is the one left with a sock still on thier foot. The party guests form a big circle around the birthday child. The birthday child, or child in the middle, is called the "monkey". Give one of the children in the outer circle a sock monkey, soft ball or plastic banana. The kids throw the object over the head of the "monkey in the middle" to someone on the opposite side of the circle. The child in the middle tries to catch it as they are throwing it back and forth. When it is caught by the child in the middle then they go to the outer circle and the one who threw the object is the new "monkey in the middle". Have the kids divide into teams and balance their sock monkey (or use red ping pong balls) on a wooden spoon. Set up an obstacle course for them to run as teams or individually against a stop watch. This game is played just like the game Simon Says where kids have to follow the instructions of a leader. If the leader says "Sock Monkey Do ... pat your head", and pats their head then the kids must pat their heads. If the leader just says "pat your head" without saying "Sock Monkey Do" and the kids pat their heads then the kids who pat their heads are out. If each child has their own sock monkey for the party have them use the monkeys in the game by making them pat their sock monkeys head. Some fun ideas for what the kids can do ... pat your head, touch the ground, hop on one foot, turn around three times, cluck like a chicken, walk like a duck, bow to your neighbor, shake your head, sing happy birthday. Snack foods in red, white and brown such as malted milk balls, cherry sours, wrapped strawberry candies, red and brown M&M's, yogurt covered raisins, twizzlers, pretzels, red apples, cherries, hamburgers, coca cola flavored gummy candies.